We had Jack visit us today, he decided to stay with us for the day and after all of our jobs were done (shopping, dinner prepared, shopping put away) all of which he helped with, he decided that he would like to colour an image and make a card. 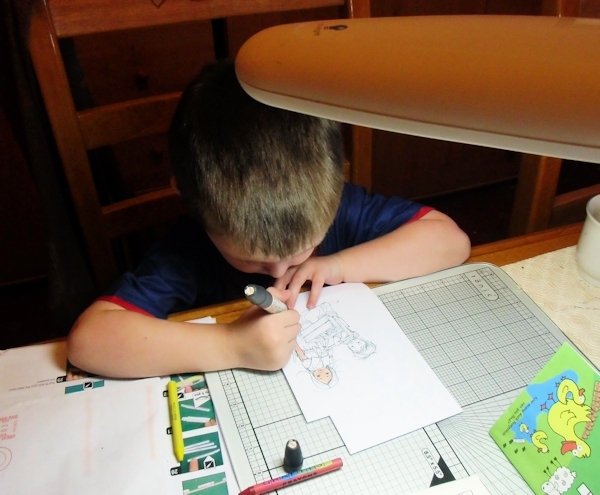 At the ripe age of 4 years old he sat at the desk and used my Flex Markers and Clam Diggers. Image from Mo's Digital Pencil and started to colour. Once finished he wanted to make a card for his Mam, this is all Jack's own design, I only helped with the cutting out and I tied the bow for him. I was amazed at how careful he was and how few times he went out of the lines. Well it sure seems like, he´s taking after his gran here, and he´s already super talented, but how cpuld he get much different, as we think of, what he´´s used to see from you Jak? He did an amazing job on this, and his card is absolutely gorgeous. It´s just awesome, when the kids begin to show some interest in doing like us, don´t you think? I just love it, when I have all 7 of my granddaughters here, who all loves to play in my craftroom, and even have their own cabinet and own space with their own stuff too now. Maybe it´s time for Jack to have a little space at grans house too now? Wow, I'd say you definitely have an artist in training for a grandson. His card is wonderful and his mom will be thrilled, a real treasure! Jack's card is brilliant, Jak! He did such a wonderful job! I am sure this card will be treasured forever! He's adorable and so talented, too! Beautiful card, Jack!! 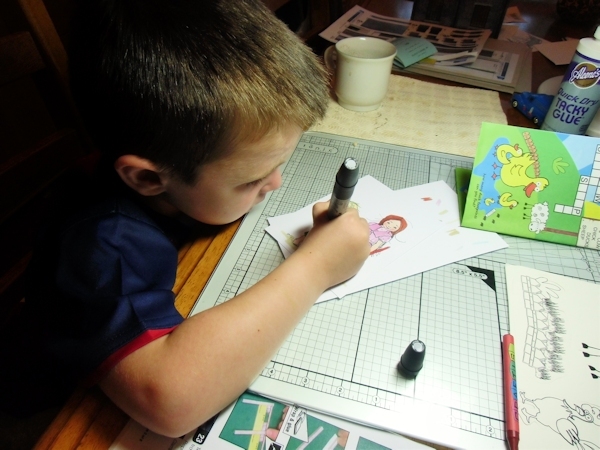 Takes after his grandma... soooo adorable to see him color so intently! He's an amazing little guy, Jak! I understand why you are so proud of him. 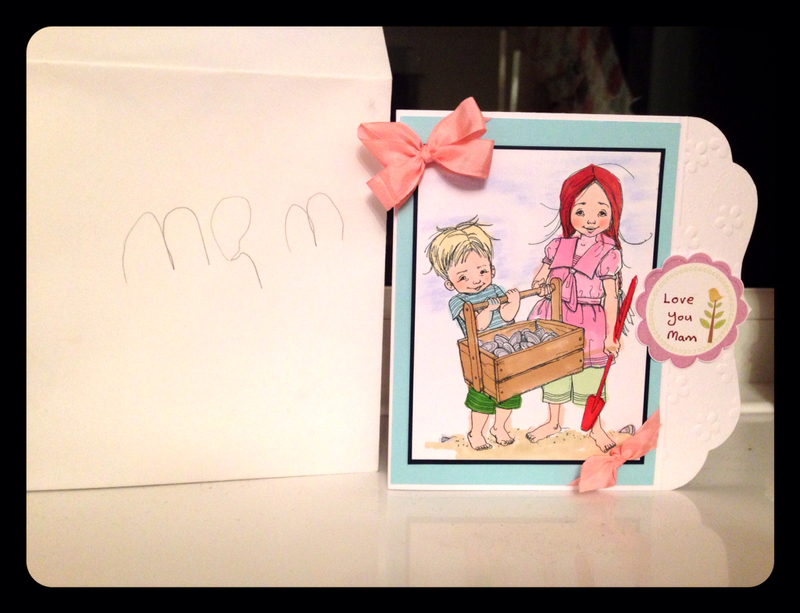 Wow Jak,Jack´s card is gorgeous ,think his mum will love it!!! WOW, WOW, WOW, he really has a talent for this, what a fantastic card. I bet mum loved it. Beautiful colouring. Must be in the genes!! Ahhh bless!!! He is such a cutie. His card is amazing for his age, his Mum will be thrilled. Pass on a hug from me!!! Well done Jack its brilliant and I bet mum loved it. must take ater his grandma.